Before your baby comes home from the hospital, it is important to make sure that his nursery is ready. There are certain safety and comfort features that every nursery should have, but you will also have the opportunity to express your creativity. Keep in mind that your baby might be using the room for several years and you can save a lot of time and money if you pick decorations that are appropriate through the toddler stage of development. 1) The Proper Furnishings– Every nursery needs a quality crib, and it is a good idea to include a comfortable chair for late night feedings. If you have enough space, a changing table would be the perfect addition to the room. 2) Safety Features – Although your baby will not be able to access most of the potentially harmful aspects of t he nursery for a few months, you should still take the time to child proof the room before she moves into it. Fortunately, this is typically very easy to accomplish. Simply place covers over all of the outlets and use child proof latches on any cabinet doors. Additionally, you should cover any sharp corners on the furniture that are near ground level. 3) Color – Creating the perfect ambiance does not need to be difficult. The room’s color scheme should feature one main color and up to two accents, and you can choose almost any color palette. However, it is important to avoid selecting a main color that is overwhelming, such as bright red, yellow and orange. Earth tones tend to work the best, and you can also use a warm neutral color for the majority of the room as long as you add a couple of splashes of accent coloring. 4) Lighting – Everyone needs vitamin D, so it is preferable to select a room that has some exposure to natural light. 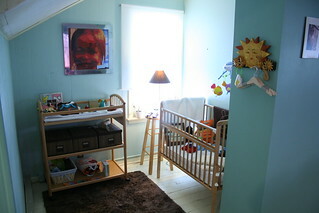 However, it is essential to ensure that the natural light will not shine directly on your baby’s crib, and you will need to closely monitor the temperature of the roo m. Any windows in the nursery will also need to be outfitted with shading that can be used to create a darker sleeping environment for daytime naps. Of course, a good soft-white overhead light is essential for those night-time feeding forays, and a lamp with a three -way switch (bright; moderate; dim) set on a table next to a comfortable rocker is sure to come in handy. 5) Play Time– Your baby needs to have the proper, sanitary space to play, and you can easily utilize a washable play yard to accommodate him. According to psychologists, playing is an essential aspect of developing proper cognitive functionality, and it is vital to ensure that your baby’s imagination is stimulated as much as possible. A portable play yard will provide your infant with a safe place to play, and it will also give him a comfortable place to take a nap. If you are short on space, you can purchase one that also doubles as a crib. Once you have made sure that your baby’s basic needs have been attended to, you can branch out into creating a fun space where you will both enjoy spending time. It is a good idea to put a radio in the room, and you should also start building a personal library for your child so that you can read to them every day. By taking these steps, you will ensure that your baby’s nursery is a healthy and happy place. As the father of two boys, Richard Freeland has had plenty of experience in decorating nurseries, as well as repairing and painting walls due to overly-exuberant play. The washable play yard, as well as other pleasing accessories, will help make your baby’s nursery an exciting and enriching habitat.